Now that all you Epcot fans have had a few weeks to recover from celebrating Epcot history at the park’s 30th anniversary festivities, let’s take a look forward at what’s next for the park. 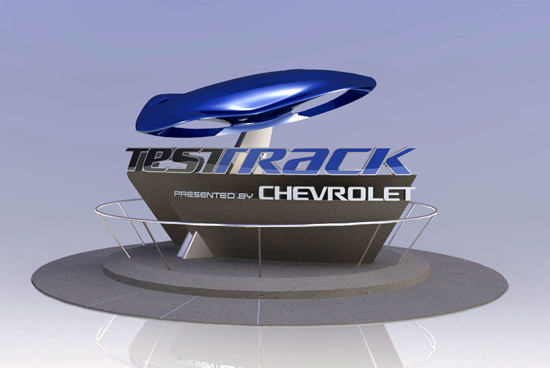 We have an update to share on Test Track – Presented by Chevrolet, which will celebrate a milestone in its construction this week as it unveils its new exterior to guests. As you can see from this image, the attraction’s color scheme has been changed from a yellow-and-black checkerboard pattern to a sleek, bold blue design that incorporates smaller icon designs that guests will encounter within the attraction. (And I think I spy at least one nod to Epcot history here. Anyone else?). The attraction’s new marquee also reflects a sleek automotive-inspired design. 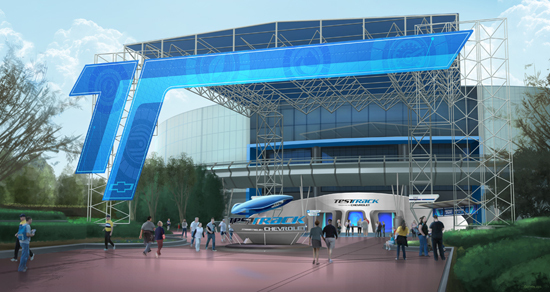 As a reminder, the reengineered Test Track will officially open this Dec. 6.